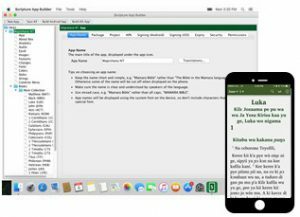 We are pleased to announce the first release of Scripture App Builder for the Apple Mac. As well as building Android apps, this version of SAB enables you to build iOS apps for the iPhone and iPad. Instructions on how to install SAB on a Mac and build iOS apps can be found in the document 3. Installing and Building Apps on a Mac. Scripture App Builder has also been updated to version 3.3 for Windows and Linux. A list of all the enhancements and fixes in this version can be found in the Release Notes. Go to Download to download the install programs and Resources to access the documentation.